Transformers: The Last Knight will take fans through a revised history of Medieval times, in a story that will offer greater explanation of the Transformers' origins and connections to Earth. Thanks to a new Transformers 5 official image, and some tie-in merchandise, fans can now see the new Transformers character known as The Last Knight for themselves. As you can see in the new Transformers 5 poster, this is the titular Last Knight in the film: A Cybertronian warrior who apparently helped affect the course of human development during the Medieval era. As a Transformer, Steelbane bears resemblance to an armored Medieval knight (a battle-worn knight, at that), and from the designs of his helmet, it looks like he might be a Prime. As for his transformation form: thanks to some tie-in toy merchandise, we know exactly what Steelbane will be in his transformed state. 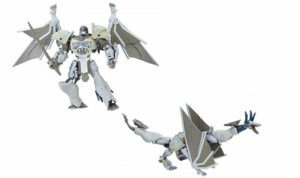 As you can see from the this tie-in toy line for Transformers: The Last Knight, Steelbane will be a dragon in his transformed state. The big guy certainly looks better (and cleaner) in his toy form, suggesting that in the movie, he will be a white or light gray color, rather than the rusted armor look he has in the poster. Fans actually got to see Steelbane in his dragon form: The metallic dragon is one of the first images we saw in the very first teaser trailer for The Last Knight. No telling how Steelbane connects to the Transformers' creators, or Optimus Prime's storyline in this new installment, but along with new characters like Hot Rod, it seems fans of the franchise are going to get some exciting new Transformers to play with.